CiclaValley strikes again. Without revealing my secrets, your favorite cycling superhero infiltrated yet another Metro Bicycle Roundtable meeting. Forget that it’s publicly announced and that the cost is free, there’s no inner circle CiclaValley can’t penetrate. These meetings happen quarterlyish, but the most nebulous part about it is calling it a roundtable. Forget about circuity, there were barely any tables in the room! Talk about false advertising. To start, everyone introduced themselves along with their affiliation. When it came my turn, I announced myself as, “definitely not CiclaValley.” Who’d of thought maintaining a secret identity was so easy? The first item brought to attention was their active transportation strategic plan. You could easily tell there were a lot moving parts to this, so getting a brief overview was all I was going to handle. 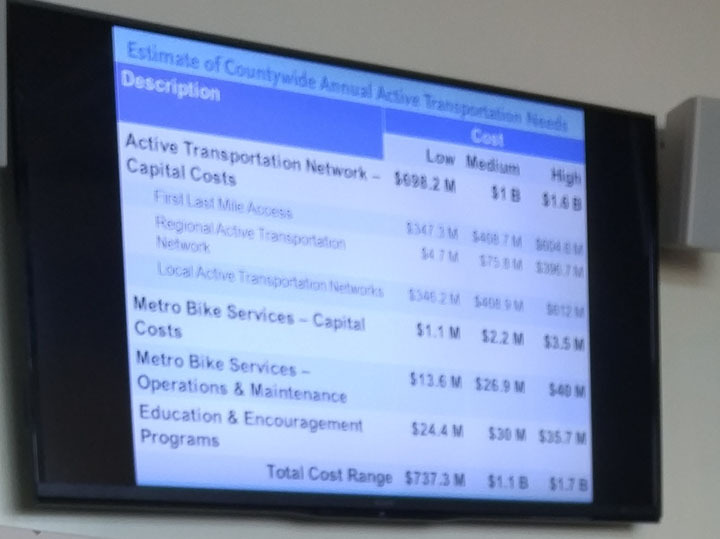 There were high and low numbers given for the level of implementation, with cycling’s funding falling in the $40 to $13.6 million dollar range. They also flashed a quick graphic from their station analysis study. I got the website down in time, but I imagine that looking at that page will be nerdy, time consuming and fun. Kevin Burton of the West Hollywood Bicycle Coalition brought up the future of the possible east valley corridor and how a rail line might impact the city’s future bike lane and if there was any coordination on this front. Thanks for sticking up for the 818. Next, we had another glance at the future Bike Share program coming to downtown. I haven’t been fully accepting of the price structure yet, but some of it was cleared up. Previously, I thought the $20 a month plan only got you thirty minutes of free riding a day. Instead, it’s thirty minutes free per ride with an unlimited number of rides everyday. That sounds more palatable, but I’m still questioning if it’s worth it to save the hassle of constantly bringing a bike lock along. A bike/bus interface study is also in the works to look at all the usage of these two transportation modes since they tend to share the same space. 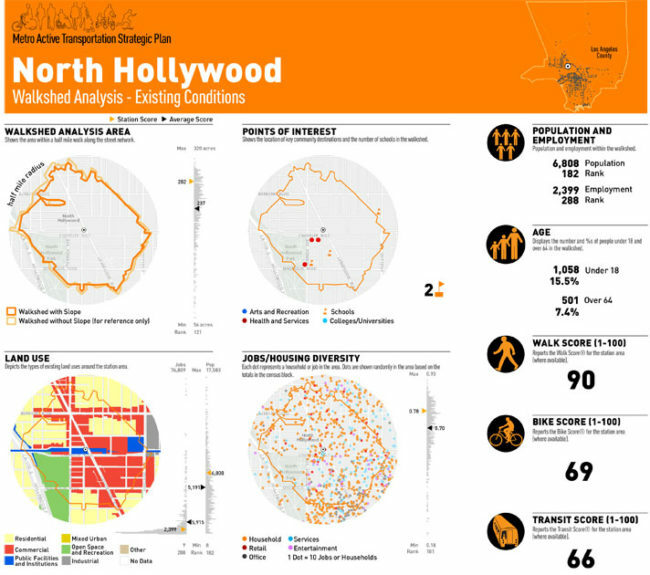 The study is supposed to include the Wilshire Corridor, 7th Street Downtown, Sunset through Silver Lake/Echo Park, Reseda’s Great Streets segment, Main Street and the Venice Blvd. bike lanes. Ryan Johnson of Alta Planning brought up how these streets are mainly without bike facilities and Uncle Ted about how they should be studying the comfort level of cyclists along this stretch. Of course, this topic was directly up Dennis Hindman’s alley, bringing up points how buses lack the proper number of bike racks, the number of stations without bike racks and how proper bike infrastructure helps the growth of cycling. In devastating news, Metro is doing away with their annual Bike Week celebration. Instead, they are trying to replace it with a new concept called, “Bike Month”. As if an extra three weeks of bike activities is going to make us forget? The highlights for May(which coincides with Bike Month) are LA County Bike to Work Day on May 19th, which features over 40 pit stops spread across the land, and on May 27th, Union Station will help close out the festivities with their Bike Night Celebration. Lastly, Metro mentioned their continued support for open streets events and seeing how there’s a number planned ahead, that’s a good thing.